On August 20, 1988, over one hundred peace activists, environmentalists, and concerned citizens from Alberta and Saskatchewan gathered at Suffield, a military research facility in southern Alberta. The protest was led by the Alberta Branch of the Canadian Voice of Women for Peace. The Voice of Women was an organization of peace activists founded in 1960 to demonstrate women’s discontent with Cold War politics and the nuclear arms race. 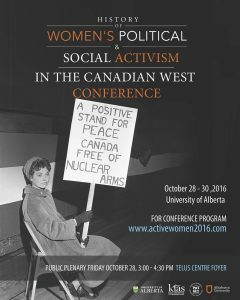 However, in the 1960s and 1980s, women in Alberta expanded their peace activism to include opposition to Canadian chemical weapons research. Peace activists played an important role in the history of Western Canadian women’s political activism. Women’s opposition to military research at Suffield was part of the long history of women’s international peace and disarmament efforts. For example, during the First World War, the Women’s International League for Peace and Freedom was founded by women from warring and neutral nations in order to halt the war. Several decades later, women’s opposition to the nuclear arms race between the United States and the Soviet Union led to the creation of the Canadian Voice of Women for Peace by a group of women in Toronto. Women from across Canada soon organized local branches of the Voice of Women, including one in Alberta, which existed from 1960 to 1994. Members of the Canadian Voice of Women for Peace were also among the most vocal critics of research on chemical weapons in Canada, especially the research conducted at Suffield in southern Alberta. In the 1960s and 1980s, peace activists from the Voice of Women protested against military research at Suffield and Canada’s ongoing role in the development of chemical weapons. Chemical weapons research in Alberta began during the Second World War when the Alberta government agreed to lease over 2600 square kilometers of land to the military. The Canadian military conducted large-scale, open-air field studies with chemical weapons, especially mustard gas. As I found in my book Toxic Exposures, Allied nations feared that World War II would become a gas war like World War I and so they conducted mustard gas experiments on their own soldiers. Over 2000 Canadian soldiers took part in chemical warfare experiments at Suffield as part of their military service during the war. They faced mustard gas experiments that included drop tests, field tests, and even tests in gas chambers. In the late 1960s, Suffield chemical weapons research came to the attention of the Voice of Women. The facility, renamed Defence Research Establishment Suffield (DRES) in 1967, faced criticism from women peace activists for its contributions to the U.S.-Vietnam War. In 1968, the Voice of Women held its annual general meeting in Calgary and some of the leaders, such as President Muriel Duckworth and Dr. Ursula Franklin met with Suffield officials. In the late 1980s, peace activists developed renewed interest in chemical weapons research in Alberta and again raised questions about the activities at Suffield. Voice of Women activists Diana Chown and Marie Laing of Edmonton carried out extensive research on Suffield’s activities. Marie Laing was elected to the Alberta Legislature as a New Democrat in 1986 and served until 1993. Diana Chown is a feminist historian and activist who supported disarmament and peace, social justice and women’s rights. Chown is also the daughter of Alice Chown, a suffragist, socialist and pacifist from Ontario who opposed the First World War. What Chown and Laing learned from their months of research led to a protest rally at Suffield in August 1988 organized by the Alberta Branch of the Voice of Women. The protest focused on revelations about the practice of atmospheric testing of nerve agents. Nerve agents are one of the deadliest types of chemical weapons. Suffield scientists had conducted “open-air testing” and dispersed nerve agents, including Sarin, Soman, and Tabun, into the atmosphere. The activists were deeply concerned about the consequences for human health and wildlife. They made Suffield’s chemical warfare activities a public health concern and an issue for public debate, leading to the protest action that drew 120 people. Activists in Alberta promoted peace and disarmament, and criticize Canada’s contribution to the chemical arms race. Whether during the U.S.-Vietnam War of the 1960s or the expansion of chemical weapons under President Ronald Reagan in the 1980s, Canadian women insisted that Canada should not support American war-making efforts. Women in Alberta have had to discover again and again the troubling history of chemical weapons research in the province. It is important to understand Canada’s complicity in the ongoing presence of mustard gas in our world. Mustard gas was first used in war in 1917, one hundred years ago, and unfortunately research on chemical weapons is likely to continue in Alberta for many more years. Susan L. Smith is a Professor of History in the Department of History and Classics at the University of Alberta. She is the author of Sick and Tired of Being Sick and Tired: Black Women’s Health Activism in America, 1890-1950, and Japanese American Midwives: Culture, Community, and Health Politics, 1880-1950. Her latest book is forthcoming from Rutgers University Press entitled Toxic Exposures: Mustard Gas and the Health Consequences of World War II in the United States. Media Statement, 23 August 1988, Canadian Voice of Women for Peace-Alberta Branch fonds, Accession no. 94.230, box 1, file 3, Provincial Archives of Alberta, Edmonton. John Bryden, Deadly Allies: Canada’s Secret War, 1937-1947 (Toronto: McClelland & Stewart, 1989), 61–62, 168, and 171; Donald Avery, The Science of War: Canadian Scientists and Allied Military Technology during the Second World War (Toronto: University of Toronto Press, 1998), 3–13, 129–31. Susan L. Smith, Toxic Exposures: Mustard Gas and the Health Consequences of World War II in the United States (New Brunswick, NJ: Rutgers University Press, 2017). Canadian Voice of Women for Peace-Alberta Branch fonds, Accession no. 94.230, box 1, file 3, Provincial Archives of Alberta; Diana Chown, “Suffield, Chemical Warfare, and Canadian-U.S. Relations,” Peace Magazine, Feb./March 1989, http://peacemagazine.org/archive/v05n1p12.htm, accessed, October 2016.
 International laws have attempted to restrict chemical weapons. The 1993 Chemical Weapons Convention added new rules to prohibit the development and use of chemical weapons, and the safe destruction of stockpiles of chemical weapons. Organisation for the Prohibition of Chemical Weapons, “Chemical Weapons Convention,” https://www.opcw.org/chemical-weapons-convention/, accessed 5 January, 2016.